Item #: 79297Y. Isn't it time to make your move to the 3D experience? The Fujitsu LIFEBOOK AH572 combines powerful processing with advanced technologies to immerse your senses into a uniquely 3D experience. You will be amazed at what is packed into this incredible mobile computer.. Blu-ray provides an extraordinary visual experience where images are so sharp and colors so intense that they appear to pop off the screen; now they actually do! Expand your visual boundaries to encompass all the dimensions now available to you. By combining Fujitsu advanced LCD technology, integrating the Xpol 3D filter and Blu-ray, you will swear you are being transported to a different universe. The LIFEBOOK AH572 is configured with software that will allow you to watch 2D movies in 3D. Your standard pictures can also come to life in 3D. Simply right click on the picture and select the TriDef viewer, then sit back and enjoy.. An advanced processor provides all the computing power you will need, even for the most demanding applications. With an advanced graphics, you will actually be able to play fairly sophisticated games, edit video, touch up photos, or a number of other tasks once reserved for desktop computers. Your light-weight mobile computer can now do a lot more "heavy lifting".. 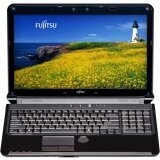 The LIFEBOOK AH572 notebook features a strong exterior, highly durable hinges, and a spill-resistant keyboard. It also comes with an accessible dust filter for easy user cleaning. This allows maximum airflow to keep your notebook running at peak efficiency.